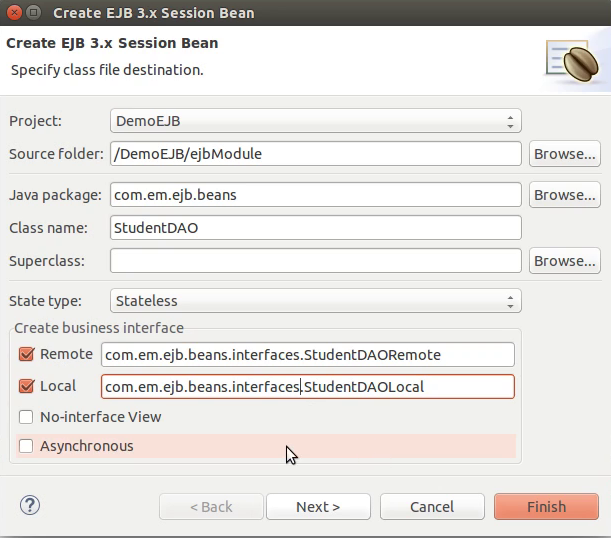 JavaEE EJB stateless session bean implementation using Local Interface, EJB injection in ManagedBean using Local Interface. EJB injection in JSF web application. 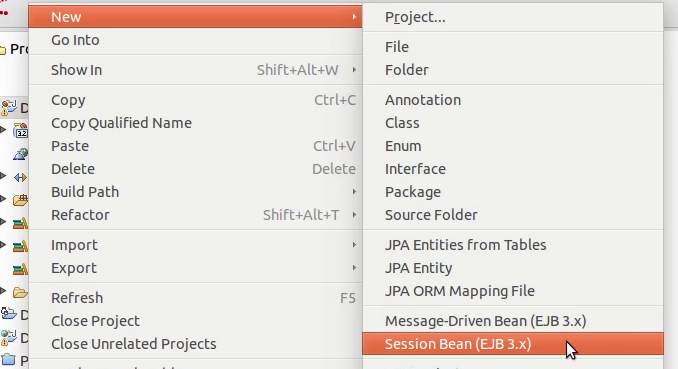 This is one of two part EJB implementation tutorial, further it is fourth tutorial from the JavaEE application development series. This tutorial is next part of the JavaEE project tutorial series, in this part we are going to describe the creation and use of EJB and we will implement it with Local Interface method. Following is a complete Series Index. In this part we are going to create stateless Session Bean. And we are going to implement two Interfaces, Local and Remote, these Interfaces are used to provide a client side implementation of the EJB. To create Stateless Session bean, you can annotate the class with @Stateless annotation and the Interfaces with @Local and @Remote as per required implementation. Eclipse Provide an easy way to automate the process. For this, right click the EJB Project and New > Session Bean. This opens up an wizard here, enter the Class name and package name. Then uncheck no interface view and check Local and Remote. You can specify the Name of interfaces here if required, otherwise system provide the default name for these interfaces. In our case these names were. Now before populating the bean class we need to populate the Interface, later on we will implement these methods in the bean class. so In the interfaces we are declaring curd methods for Student entity. The interfaces looks like this. Now we are ready to define the StudentDAO class, in this class we will implement both these interfaces, but in this tutorial we will use only Local Interface, Remote interface we will use in next part. the StudentDAO structure is implemented like this. As you can see in the code above we have used the reference of the EntityManager with annotation @PersistenceContext, this enables us to use the container managed transaction easily. We have defined the interface method to perform the CRUD operations. Please not that in the last method we have used the NamedQuery that we defined in JPA entity, this makes easy to get all entries from student database. Now we are going to define the client side for the EJB access. 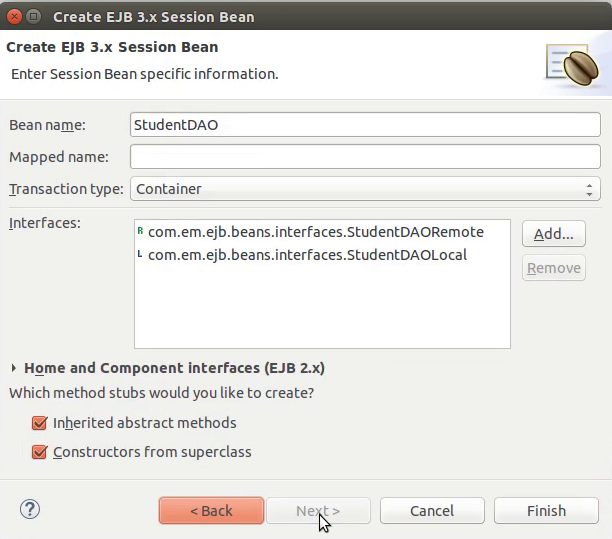 We are going to use injection of EJB Local into the Managed Bean and we'll use managed beans to use the StudentDAO methods we define. And because we are only demonstrating the access of EJB we will only create a test method to test the working on EJB. So we create a Java class and annotate it with the @ManagedBean and @ViewScoped annotation. We are using the @EJB annotation to inject StudentDAOLocal interface and obtain a reference to StudentDAO. the test bean looks like this. We have our test method createStudent() and we have created a Student object and filled it with sample values, and now we are going to use studentDAOLocal refrence to invoke the create method of StudentDAO and this will persist our sample Student object into the database. But to invoke the mehtod in managed bean we need a jsf page. we are not going to use our defualt index.xhtml page because we are not doing much except invoking a method. Note:@EJB injection is a post construct injection, if you try to access it inside the constructor, it will not work, as the StudentDAOLocal will remain null at that time, so it will throw NullPointerException. Following is the code of our index.xhtml page which is only invoking the method. This will invoke the createStudent() method which will add an entry in the database. This will not output anything on the page, but will add the entity in the database. This is it for this part. In next part of this tutorial we will come back with the detailed and step by step way of how you can operate with the Remote interface implementation. We will demonstrate the JNDI based lookup operation on RemoteInterface.